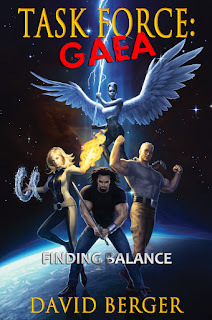 #3: Task Force: Gaea has been in the works since 1985 (if you count "The Olympus Corps.," the original short story, as the beginning), so it has predated my teaching career. I didn't really start promoting my writing in the classroom until 2002, when I started teaching high school English. From the onset, my students seemed intrigued about the idea of their English teacher writing a novel, and they would ask questions about it. This meant I had to know my book well. I had been working on the manuscript more at that time, although I wasn't committed to some of the plot points that later made it into the novel, but I had enough knowledge to share to pique their interest, or hoped to do that. A poster entitled, "A Work in Progress" hung in my room, with a plot summary and the artwork I had acquired of my four main characters. Back then, I hadn't solidified some of the key events, so student interest prodded me into committing to some of the ideas I would later cement to the text. In essence, my students were putting a level of pressure on me to keep up with the writing, and that helped me move past the writer's block I occasionally fought with over the first few years at the high school. Trying to manage a full time teaching job, one which I thoroughly enjoyed, with writing, proved quite difficult, and I had trouble "finding balance," as it were, with all aspects of my life. When I began teaching in the International Baccalaureate program a year later, students again expressed their interest in fantasy fiction or even in the fact that their teacher was writing a book. One student in particular, Jason Pioli, wanted to know more about the book and when "his people" and "my people" would be on the same page, so to speak. He kept asking for a sample of the work, and his interest fanned the flames under me; I became even more eager to finish. After some stops and starts, I was able to give Jason a taste of the novel, and—because of his ongoing support—I named him in my Acknowledgments. Our "people" were finally aligned. So, thank you, Jason. Flash forward to August 2011. My current students, also eager to know more about the novel, were in for a treat. I had finished the manuscript, had it read by a few people, and had started the process to publish. I had already been in touch with Michael Hamlett, the artist who had created the inspirational pieces for me a decade ago, and had finished the cover image. Over the winter break, I had a poster made of the cover (see above), and it was hanging on the wall in my classroom when we reconvened in January. As soon as they saw it (and it hangs next to posters of Superman, Wonder Woman, and Batman reading), their interest seemed to explode. Their excitement became fuel for me yet again, and I pressed on with publishing even more enthusiastically. I had placed a copy of the cover image in front of the class (an 8.5" x 11" piece of photo paper with the entire cover image, front, spine, and back) for a while, so when I replaced it one morning with a proof copy of the book, I saw their excitement build even more. The first copy that I signed was for a student of mine, and I was unnerved. What do I say? Do I just sign my name? I wanted to personalize the message. It was historic moment for me. My students have been a part of my life for 20 years, and they deserve credit for having been the inspiration at various points in my writing. Thank you, everyone. You've made this a worthwhile journey.